These dice measures 2 1/2 x 2 1/2 inches each, comes with adorable color of green and red. These dices are perfect for any family gatherings and also a perfect party favors for your kid’s themed birthday party and makes a perfect party bags stuffer! Perfect accessories to any board games that use dice such as – snake and ladder, Bunco, Yahtzee, Shut the box and many more. Foam dices can also act as great learning tool for your kids; teach them about math, numbers and many more while having fun! If you are not completely satisfied with your purchase, we will issue you a full refund for your satisfaction. (Although we are confident that you will love it.) Toy Cubby is a brand you can surely trust! FAMILY FUN | BIRTHDAY: These dices are perfect for any family gatherings and also a perfect party favors for your kid's themed birthday party and makes a perfect party bags stuffer! BOARD GAMES: perfect accessories to any board games that use dice such as - snake and ladder, Bunco, Yahtzee, Shut the box and many more. EDUCATIONAL TOOL | FUN TOYS: Foam dices can also act as great learning tool for your kids; teach them about math, numbers and many more while having fun! 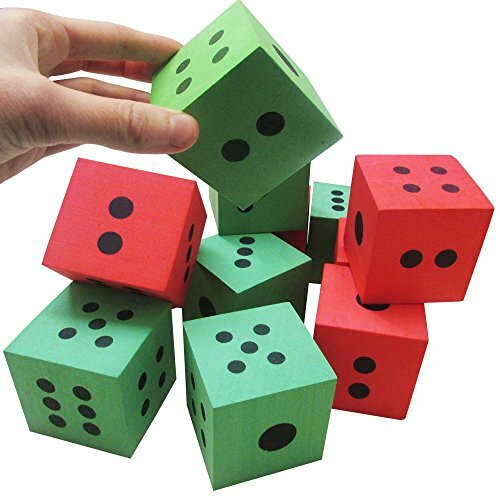 FOAM DICES: these dice measures 2 1/2 x 2 1/2 inches each, comes with adorable color of green and red. 100% MONEY BACK GUARANTEED FOR YOUR SATISFACTION: If you are not completely satisfied with your purchase, we will issue you a full refund for your satisfaction. (Although we are confident that you will love it.) Toy Cubby is a brand you can surely trust!